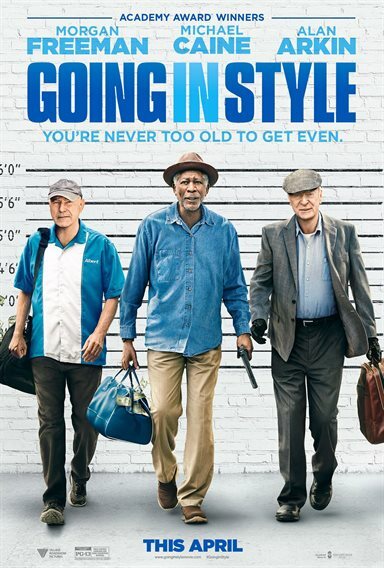 Download Going in Style in Digital HD from the iTunes store. 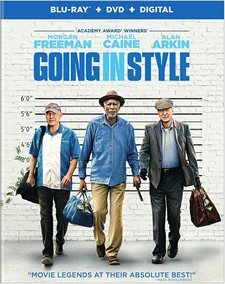 Going in Style images are © Warner Bros.. All Rights Reserved. In 1979 George Burns (Oh, God! ), Art Carney (Last Action Hero) and Lee Strasberg (...and justice for all) starred in director Martin Brest's (Scent of a Woman) comedy Going in Style. In 2017 Zach Braff (Scrubs) directed and produced a remake of the film starring Michael Caine (The Dark Knight), Morgan Freeman (The Shawshank Redemption), and Alan Arkin (Little Miss Sunshine). With some updates to the ‘70's version, the three leads and Braff offer some humorous moments along with commentary as to the state of the aging population in this country. Joe (Caine), Willie (Freeman), and Al (Arkin) are three friends in the twilight of their lives. They all worked for years at the same plant and have just found out the company is moving to Asia and their pensions will no longer be honored. Meanwhile, Joe got sold a balloon mortgage and his payments just increased three fold, while Willie needs a new kidney. Al is basically homeless and sleeps on Willie's couch. The news about their pensions hit the three men hard so when Joe hatches a plan to rob their bank (after having been in the midst of a heist at the same bank earlier that year), the other two men reluctantly agree to help for a share of the spoils. That is when the real work begins. Joe seeks out his deadbeat ex-son-in-law who hooks him up with a shady character, Jesus (John Ortiz; Silver Linings Playbook), who teaches the three elders the art of stealing. Jesus "trains" them for a share of the money and helps them perfect their plan. Three weeks later, they almost flawlessly pull off the job but a little slip up may just be their downfall and get them caught. I'm not sure how you can go wrong with a cast like Caine, Freeman and Arkin. The veteran actors have an easiness that makes it seem realistic that they are good friends and have been for a long time. Arkin is the grumpy one of the group which adds some comedic moments, especially when they attempt a "trial" run at being thieves at the local grocery store. Caine and Freeman are great in pretty much anything they do. Ortiz fits well in with the three older actors, and smaller roles played by Ann-Margret (Grumpy Old Men) and Christopher Lloyd (Back to the Future) don't go unnoticed. Braff's direction is fine, but nothing extraordinary, and the script is just ok. The Blu-ray is presented in 1080p high definition video with a 2.39:1 aspect ratio. The picture quality is what one would expect from a Blu-ray with bright colors and a sharpness that makes the video clear. The DTS-HD Master audio 5.1 is crisp and clean and the dialogue is well dispersed and mixed nicely along with the background noises and soundtrack. The Combo pack offers a Blu-ray disc, a DVD and a digital download code for one price. Besides the audio commentary with Zach Braff, the only other extra is a collection of deleted scenes. Both are interesting and entertaining enough but I would have liked to see more like interviews with the actors perhaps. While meant to be a comedy, this remake makes a statement regarding our elderly and how we treat them. After working all their lives, greed sees their pensions ripped out from under them and their social security isn't enough for them to live on. Desperation makes people do some crazy things and three old guys robbing a bank is somewhat laughable. Overall, it's a cute movie.